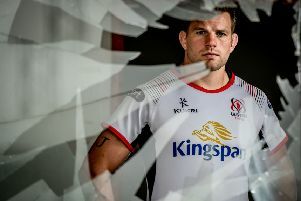 Ireland and Ulster centre Jared Payne has been ruled out for the next three months with a kidney injury. Payne sustained the injury during the first half of Saturday’s 27-24 victory over Australia in Dublin, but he will now miss the Six Nations games against Scotland, Italy and France. He could return for Ireland’s final two Six Nations fixtures, away to Wales on 10 March and then a Dublin game against England eight days later. Fellow Ulster player Andrew Trimble is out for a fortnight after picking up a foot injury against the Wallabies. The wing suffered a “tendon issue” and was forced off after 30 minutes at the Aviva Stadium. The Ireland team management also confirmed that full-back Rob Kearney was “removed” from the pitch as a precaution.